Charlie Fellowes (foreground) and Jeremy Epstein in front of Gordon Cheung painting (Rush of Blood) at Edel Assanti gallery, London 2012. THE EXCITEMENT OF 'pop up' culture was fun while it lasted. Although by no means a new phenomenon, it caught the imagination of London art-niks nurtured on the modern mythology of Frieze - an event now some 25 years old! Squatting empty buildings had been a common art activity in Europe throughout the Sixties, and Claes Oldenburg's 'happenings' utilised empty shop premises in Manhattan more than 50 years ago. But like most trending activity, an influx of amateurs and chancers diluted the essential impetus of the original participants. 'Pop up' is now more akin to fast-buck opportunism and speculation, nowhere more so than in contemporary art - a business that is beginning to resemble the free-for-all of a gold rush. And just as transient. But amidst the universal clamour for attention there have been some serious talents emerging, despite the economic downturn and despite the competition on the streets. A handful of new galleries - born since the financial crash of 2008, the worst in over 75 years - have proved worthy of serious attention. One of these is Edel Assanti based in London's Victoria district. From the inaugural show (Jonathan Lewis, Peter Lynch, Peter Macdonald, February 2010) it was clear this was to be a space to watch. For a start, the building at 276 Vauxhall Bridge Road was idiosyncratic and shared with two other dealers: Jack Bell and T1+2. It had a basement for free-form projects and a studio space that would be occupied by an artist getting hot: Gordon Cheung. Turner Prize winner, Martin Creed, performed in the basement on one memorable occasion. And it had two charismatic directors who, at the time, were fully employed at major London galleries. 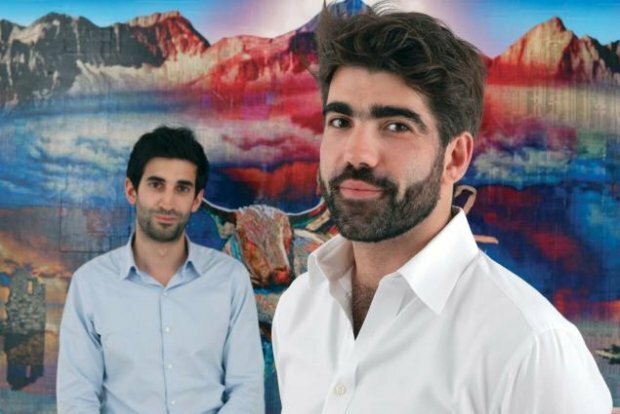 Charlie Fellowes and Jeremy Epstein, both trained young gallerists with no pretensions of being artists themselves ('one gets in the way of the other') and their broad experience convinced them the time was right to take control. Initially Edel Assanti operated at evenings and weekends, but eventually Fellowes quit his day job to act as full time director and now tends to be the spokesman for the gallery. 'It was not a leap of faith but of logic', he declares, perched in his spartan office at 276. However, his mind is elsewhere, two doors down in fact, for that is where the gallery is relocating at the weekend. So successful has the past two years been that the duo are confident enough to move to a ground floor, renovated space at 272-274 Vauxhall Bridge Road. 'From idea to opening in just 10 days', he beams, confident his builders will be out for the launch exhibition (Stuart Bailles, curated by Nadim Samman). And indeed they are, for the space looks sharp and tight at the Private View, when, despite torrential rain, the hip of the London scene turn out to celebrate this milestone event. So who are these young hot shots with boundless enthusiasm and a confident vision? Both Fellowes and Epstein are Londoners who did their degrees away from the capital (Newcastle and Bristol respectively). Charlie (29) eschewed art school and joined Abbott & Holder through a family introduction, progressed to the Sladmore Gallery, and then onto five years at leading photography dealer, Hamiltons, as gallery manager. Jeremy ('Jez') at 27, is the more academic of the two (according to Fellowes) and they met at Hamiltons' openings - finally becoming friends through discussing Epstein's own plans for a gallery. It was Epstein's idea to approach Westminster Council for permission to temporarily occupy their empty properties for art related events. 'It was not a new idea,' says Fellowes, 'but in SW1 it was unusual. It would have been pretty impossible before 2008. We did a number of shared projects with people like Poppy Sebire.' Then Grosvenor Securities, the owners of 276, approached them with the idea of doing something similar. Serendipity. The nature of the building (tall, narrow, main road) somehow had just the right timbre, and their idea of collaborating with other dealers chimed with the zeitgeist perfectly. So finally, what of the memorable and melodic name: Edel Assanti ? Charlie Fellowes smiles at an all too familiar question. 'Joan Edel was a Polish ancestor of Jez - and a resistance fighter - and Ricardo Assanti eloped with my grandmother' he says. It surely seems the perfect pedigree for one of London's most dynamic young spaces...!